There’s no business like show business, and on the cruise ship, the show must go on, every night! Guess what today’s story is about? How about Entertainment on Carnival Sunshine. 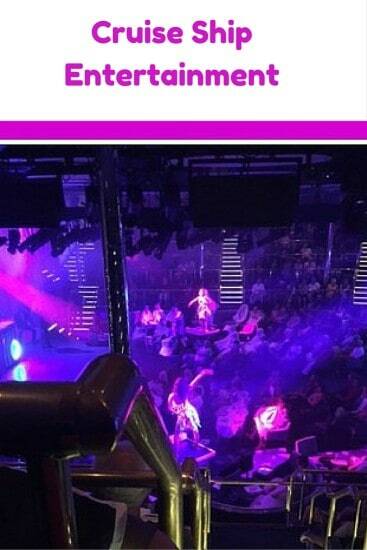 When does entertainment happen on a cruise ship? That’s is all debatable because from people watching, to shows during the day, and entertainment at night, there is always entertainment on Carnival Sunshine. My favorite entertainment when cruising is after dinner. Dinner time always lets you fuel up again for that much needed second wind on a cruise. We really liked to push ourselves, and I don’t know why, but we go, the whole time. Gratifying, pleasurable, non-stop fun, like a kid in a candy store pleasure is what we derive from cruising. Join me for this story of Entertainment on Carnival Sunshine as I lavishly live my cruise out loud! I love shows, perhaps it is my musical background in Piano, Swing Bands, Marching Band or even just playing the saxophone, not matter the reason, I drag my poor husband, who is wonderful about going to every show that is on the cruise! Our trade-off, at the end of the shows is when we head to the Lido Deck and then he heads to Deck Level 10 to enjoy a cigar and a drink while I snap up a Margarita from the Blue Iguana Cantina- I still think this is a win for me too, lol. 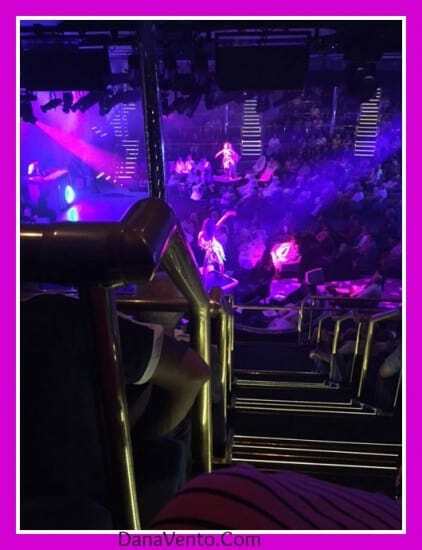 The Carnival Sunshine has so much to offer that you just can’t help yourself but indulge more and more and more, and that is what we did every night after dinner, we headed to a show. Here’s our lavish story of cruising on the Carnival Sunshine and the entertainment that was available, plus all the little tips and tricks you want to know when heading to a show on the ship. We at Your Time Dining and every night I would make sure to read my FunTimes before we headed out of the room to the restaurant. I needed to know what time and where to find the entertainment, as I did not consider it a night until we had watched a show and listened to some comedy. It was easy to satisfy both wants and I have already discussed the Punchliner Comedy Club so now I want to introduce you to the Liquid Lounge where awesome singing and dancing take place. We never got lost going to the Liquid Lounge, we found our way with ease. Here’s your first little tip, if you don’t want to be part of the show, or interact, don’t sit on the first floor, front and center or side. However, if you want in on the action, get up there, but get there when the doors open because honey, those seats fly out of there! Generally, it seemed that there were two shows: one at 7:15P and one at 9:15P, so the early birds caught the tequila worm(lol) and the early show while us late bloomers captured the last show. The shows last for just thirty minutes so pay attention, because they start and finish quickly. The shows give you just enough to want more, but allow you to not be STUCK in any one thing too long!–Woot Woot Party Bus, I mean, Party Ship– and how old am I again? If you are going to be late, it is easiest to stand on the second level in the bar area and watch the show, rather than disrupt others as the seats are not that easy to get from section to section and you begin to block other’s views. In other words, if you are tardy to the party don’t ruin it for those that are already in party mode! If you are drinking liquid and need a ladies room, it is right outside the top level as you walk out on your right. I know this because a) I needed it one night b) many others were in search of it! Now you can order drinks in the Liquid Lounge and we did I mean what is a great show without a great glass of wine? No Flash Photography, and no Videoing. Please keep this in mind when you pull out those smartphones! What Types of Shows Can I Expect To See In the Liquid Lounge? The shows vary. We went to hear Motor City which was a variety of R&B Sounds of the 60’s, 70’s an 80’s. We also attended Latin Nights(and saw a Pitbull Look Alike, no kidding) and then Studio VIP which was the funk and fashion of TV’s “Soul Train”. This one blonde girl, sorry that is the only way I can describe her, can sing so strong, her vocals are amazing. In fact, the entire cast can sing well, but she was definitely my favorite. She hit the notes, commanded the stage and captivated all of us in the audience without question, she is that good! Wish I knew her name, but I don’t! As you can see, we spent a nice amount of time at shows. We did not make the Hasbro Show, because we were doing some other things, including shopping and drinking and playing in the Casino. You can definitely be well entertained while on the Carnival Sunshine and again, there are no additional charges for this show, it is part of your cruise package! Lavishly live entertained while at sea on The Carnival Sunshine. * A room was provided while I was on-board the Sunshine -however, all opinions, stories and images are my own as I lavishly live life out loud. How about More Insider’s Scoop On Cruising?